Research Ethics Blog | By Nancy Walton, P.D. It’s been a while – a LONG while – but here goes a renewed effort to try to keep people engaged in all things research ethics. It’s a busy time of life for us, with a ton of demands, but I’m feeling a strong pull towards trying to rekindle the Research Ethics Blog. Let’s start with a post about something with which most of you will be familiar. Bill Jenkins died recently. Many of you will not know his name – I also admit I didn’t, until now. You can read his obituary in The New York Times here. Dr. Jenkins, an epidemiologist, was working as a statistician in Washington in the 60s when he learned of the ongoing Tuskegee Syphilis Study. When he did his own research and reported his serious concerns about the ethical conduct of the study to his supervisor, he was told “not to worry about it”. He continued to advocate and write about the troubling ethical aspects of the study. With his efforts and those who worked with him, including Peter Buxton, the study – and a serious ethical problem – was eventually highlighted in the New York Times and finally shut down. Many people have heard of the Tuskegee study, and most foundational courses in bioethics and research ethics teach this as a key case study to illustrate the principle of respect for autonomy, the value of informed consent, and the notions of voluntariness and vulnerability and racism in medical research. While many might nod and say “yes, yes we know about this study, sure”, there’s one thing I always emphasize to my students when we talk about this study in detail. This study did not happen in one small corner of the world, far away, or a long time ago. This study involved many stakeholders and collaborators at local, state and national levels, who passed the work on through generations of scientists, who continued the research and who didn’t ask questions about what needed to change – or stop – for over 40 years, until 1972. We often think that we live in modern and progressive times. 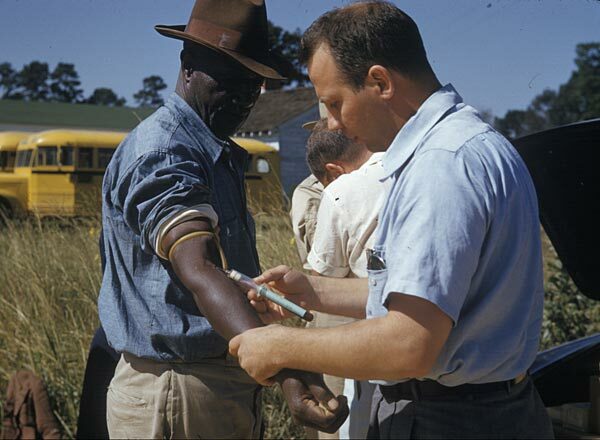 1972 was not so long ago to allow us to think comfortably, “Well, something like this would never happen now….” The last widow of a Tuskegee survivor died in 2009 – and subsequent generations of Tuskegee survivors continue to bear the burden of the legacy of the Syphilis study. Throughout Jenkins’ illustrious career, he achieved much in demonstrating that medical research was biased against persons of colour, against those who were already traditionally underserved and marginalized. Jenkins worked to not only address these challenges explicitly in a number of contexts including HIV and AIDS, and he also worked to recruit more persons of colour into public health professions. He led the work to ensure continuing medical benefits to the survivors of Tuskegee and their families and, in 1997, to generate a formal apology from the US federal government to the men of the Tuskegee study. Next time I teach Tuskegee, I’m going to also teach about Bill Jenkins. -Thanks to Alex Karabanow for pointing me to this story. In the piece linked below, the author (a professor of sociology at the University of California) argues that modern norms governing human-subjects research are actually stronger, or at least more clear, than those governing government-sanctioned torture. Some of us professionally involved in research ethics governance might not agree that norms of that discipline are beyond debate. Also, we might wonder whether ‘exporting’ the norms of research ethics for use in prosecuting torture is likely to be good for research ethics, or will it end with a reversal: Some will begin with the premise that the CIA’s torture/research program is justified by its public-interest objectives. And if the CIA can, er, ‘break new ground’ in the ethics of research, then why can’t others? Some doctors worry that an effort to grant terminally ill people more access to unproven drugs might offer them false hope or even be harmful, but advocates for a “right to try” say patients should have more opportunities for treatments that could extend their lives. Should a University President Resign over Research Ethics? …During his first year at the university, Kaler had to make a major decision. Prudent management would have involved meeting with Elliott, learning about the specific ethical issues related to Markingson and broader concerns about psychiatric clinical research, and dealing with the growing scandal. But Kaler chose instead to perpetuate the prevailing coverup. He opposed any independent review, never responded to the charges made in the media, ignored or dismissed critics, and stood firm in his belief that it would all blow over. In so doing, President Kaler tarnished his office and abandoned the principles of truthfulness, openness and integrity…. On the blog of Policy Options magazine, here’s a very good piece by our pal Tim Caulfield, called Homeopathy and the ethics of researching magic. And via the same outlet, here’s my piece in which I partly disagree with Tim: Homeopathy and Research Ethics. And just recently, An anonymous Canadian foundation grants $3 million to study naturopathic oncology. But such a study could not be done in Canada because it a study funded by an anonymous source would violate the Tri-Council Policy Statement. Page 29 of the Policy Statement makes clear that informed consent must include identity of the funder or sponsor.